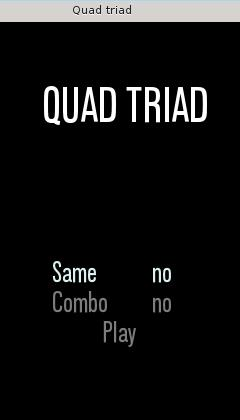 Quadtriad is a two player card game with selectable rules. It is based on the game triple triad from Final Fantasy 8. The Name "Triple Triad" always sounded dull to me, since every card has four values. Two player place cards on a 3x3 grid. Each card has four values (top, bottom, left, right). If your cards respective value is higher than the neighbouring number of another card, you take over the card. After the grid is full, the player with the most cards wins. Quadtriad is written in fast and optimized c++11 and uses the SFML2 engine. It was developed in June and July 2015. See the additional links for the bitbucket repository for source code. There is also a blogpost about writing games (and specifically this game) which you can find in the additional links.